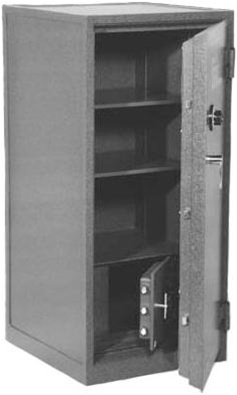 With its inner and outer safes the Gardall Z-2218 B Rated Burglary and 2-Hour Fire Safe/Chest Combination can protect your important valuables from theft in the inner safe and safeguard records and documents from fire damage in the outer safe. The inner safe or "chest" has a "B"-rated construction with triple boltwork and an independent relocking device. The outer safe is insulated to withstand 1850°F for up to 2 hours. Both safe doors come standard with a hard plate for increased protection and UL listed group II combination locks with built-in relocking devices. The exterior door features three interlocking bolts that extend into the safe walls and a full length locking bar on the hinge side of door to deter forcible entry by removal of hinges. Mounting hardware is included and electronic push-button lock option is available.